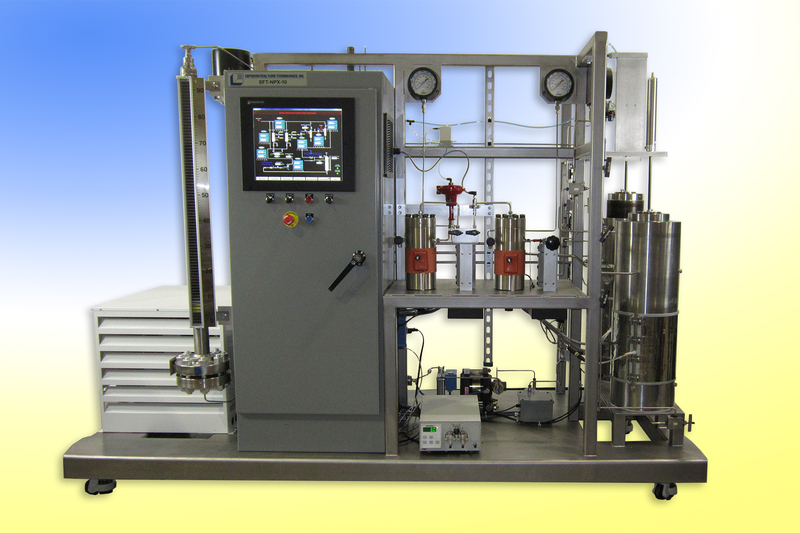 The SFT-NPX-10 Processing System is designed to perform supercritical fluid extractions incorporating either single or optional dual 5, 10, 20 Liter sample vessels with single or optional dual separators, and integrated interface controls. The system includes features that facilitate the transition from our laboratory scale equipment to production processing systems. 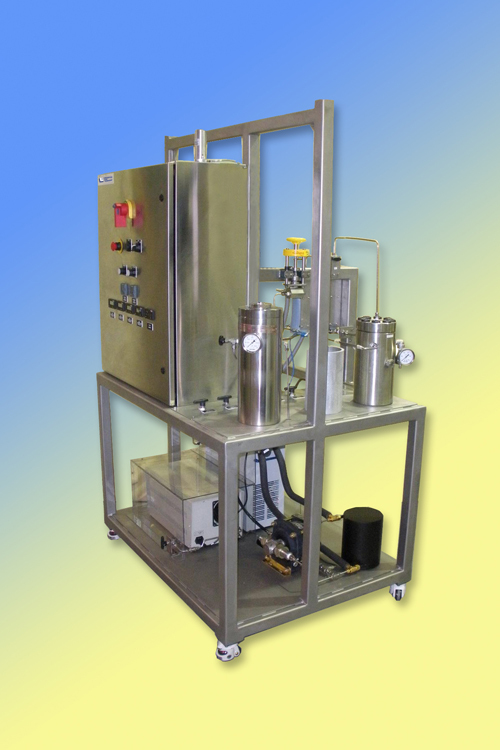 This system is configured to enable supercritical carbon dioxide (SCCO2) extraction using 10 Liter extraction vessel(s) in a single or dual configuration rated for operation up to 690 bar and 120°C. The system includes either one or two separator vessels, a pneumatic CO2 pump with an integral waterless pre-chiller to maximize pumping efficiency, and all associated valves and piping. The system is mounted on a mobile powder coated steel or stainless steel frame. Pressure is controlled in the extractor(s) and separator(s) with Butech control valves and electric heat exchangers. Using Supercritical CO2 to perform extractions on botanicals, herbs, spices and other natural product materials has significant benefits over the use of traditional liquid solvents. CO2 enters the supercritical region at an elevated temperature and pressure, where it is no longer a liquid or gas. It becomes a supercritical “fluid”. Under these conditions, the SF fluid possesses many of the same characteristics of a liquid solvent with the added benefit of high diffusivity, and pressure tunable solvency power. There is no need to perform a distillation step since returning to atmospheric pressure the CO2 becomes a gas and can be recycled. This means NO residual solvents are in the extract. Additionally, given that the solvency power of the fluid is pressure dependent, it is possible to “fractionate” and obtain multiple fractions from a single raw material. 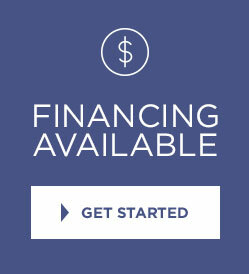 This is impossible to do with traditional liquid solvent and distillation processing. Supercritical Fluid Technologies also offers training with each system which can be customized for your specific application. The process cycle begins with fresh CO2 gas from liquid bulk storage. The effluent stream passes through a coriolis mass flow meter to provide accurate flow measurement that is insensitive to variations in process stream pressure and temperature. The CO2stream is delivered at 5°C and 725 psi (5.0 MPa) to a pneumatic air-driven pump (PMP1). 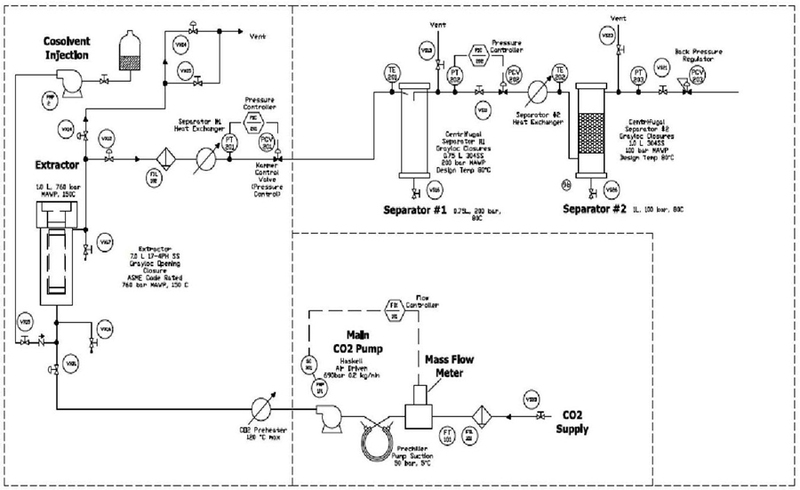 CO2 mass flow is controlled by modulating the air pressure applied to the pump via an electro pneumatic regulator. The process stream is heated to a maximum process temperature of 120°C. A pressure transducer measures the extraction vessel pressure. The system pressure is controlled through modulation of a Butech control valve (PCV201). The process stream subsequently flows into the Separator #1. Referring to the flow diagram, the system includes a heat exchanger prior to the extractor pressure control valve (PCV201). This heat exchanger is used to warm the process stream up to 160°C, depending on process requirements, prior to flow through PCV201. 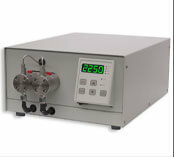 Under supercritical pressure conditions, these temperatures increase the solubility of extract in the SCCO2. Following expansion through PCV201, a portion of the extract falls out of solution. The piping from PCV201 to Separator #1 is extremely short so that there is little opportunity for the extract to clog the lines and so that there is high flow velocity upon entry into Separator #1 to facilitate centrifugal separation of the extract solid from the CO2 gas stream. Subsequent to Separator #1, the CO2 flows through a second Butech valve (PCV202). This valve regulates the pressure in Separator #1. The CO2 next flows through the Separator #2 (if furnished) heat exchanger and into the second separator. The pressure within Separator #2 is maintained with a backpressure regulator (PCV203). Subsequent to Separator #2, the CO2 is vented to atmosphere or optionally recycled. All automated high pressure shutoff valves in the system are medium pressure valves rated to at least 10,000 psi (68.9 MPa). High pressure tubing is at least 1/4 inch outer diameter and will be rated to 10,000 psi (68.9 MPa). Optional PLC/HMI controlled systems utilize a National Instruments cRio programmable automation controller to regulate the pressure, flow and temperature process variables. These are the identical controls to those typically found in larger scale commercial production systems. 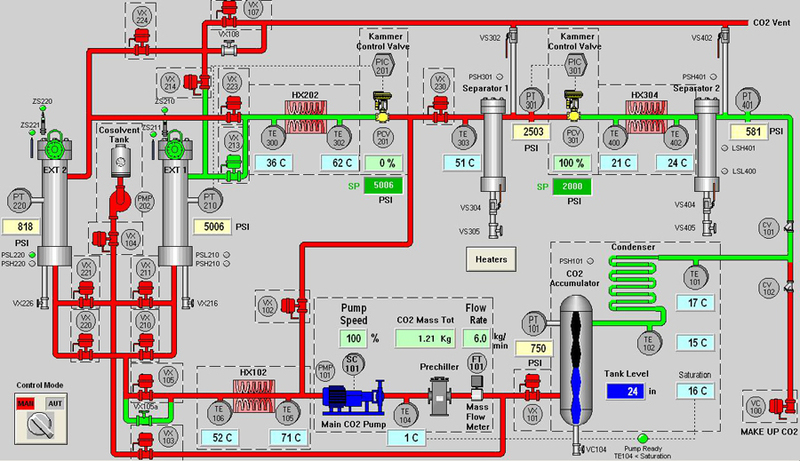 The process conditions in this control system will enable direct translation to a large scale processing system. The operator will use a touch screen operator panel to monitor process conditions, observe system status, review process histories, initiate process cycles, and enter process parameters. Flow Rates: Pneumatic air-driven CO2 pump up to 1.0 kg/min at 10,000 psi (68.9 MPa). 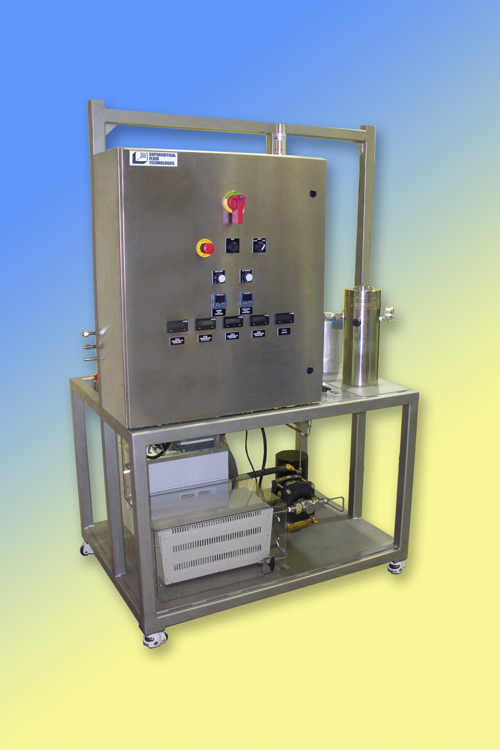 Patented Electropneumatic regulator for accurate CO2 fluid delivery. Active regulation of temperature and pressure in Separator #1. Regulation of temperature and pressure in Separator #2. CO2 Supply: Liquid CO2 cylinder with dip tube. House Air: Dry air, regulated to 110 psi.